SGen is Mono’s generational garbage collector. DTrace is a programmable dynamic tracing framework and is available for OS X and Solaris, among others. 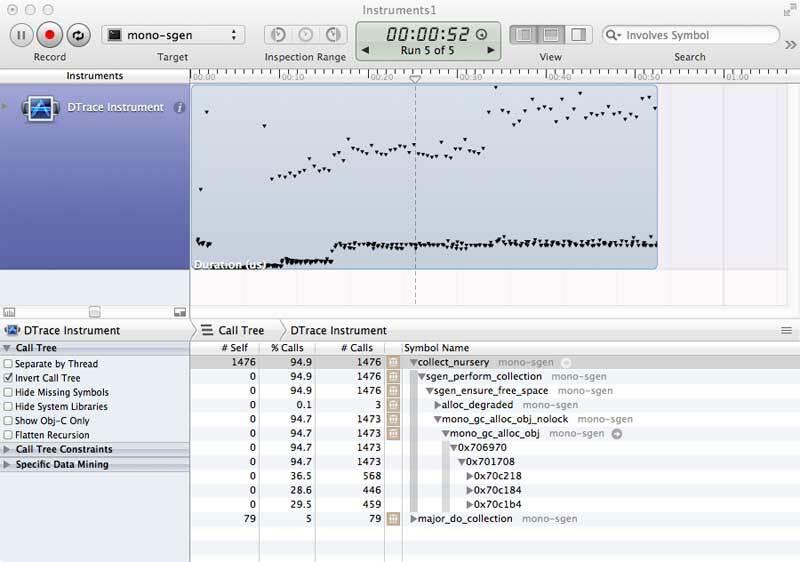 DTrace provides an interface for applications to define their own probes which can then be observed, and actions triggered. We have recently added a few probes to SGen and I’d like to show a few simple things that can be done with them. 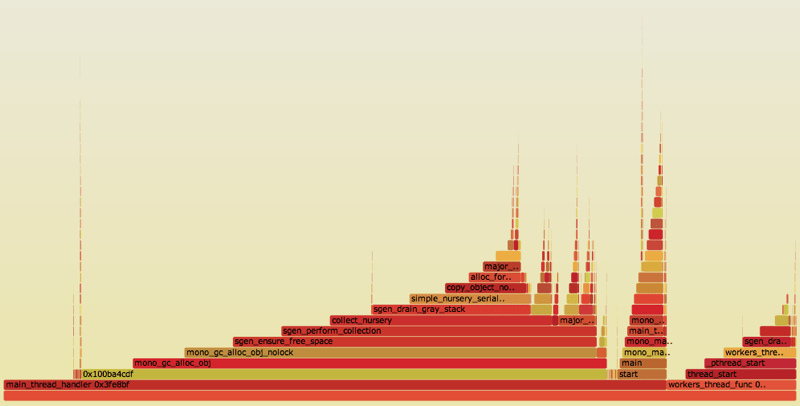 The program I’m using to demonstrate DTrace here is IronPython, running pystone. 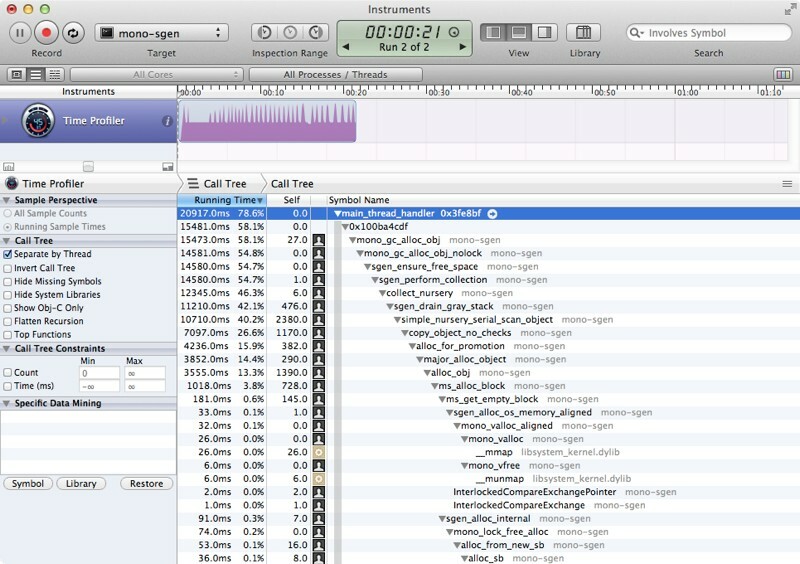 SGen’s DTrace probes are currently only available on OS X, on mono master. How long do garbage collections take for a specific workload? The graph for 0 shows collection times for the nursery, the graph for 1 shows times for the major collections. We can see here that the majority of nursery collections took about half a millisecond, with 4 outliers taking around 10 ms. There were 3 major collections, two of which took around 16 ms and the third one barely took any time at all. The dots lower down in the scatter diagram are likely nursery collections, the higher up ones major collections. Not counting garbage collections, how often and for how long is the GC lock held? The GC lock is taken shortly before collections start, and released shortly after they finish. It’s also taken in a variety of other cases. Naturally we want to avoid holding it for long. SGen takes the lock quite often, but apart from one outlier at about 1 millisecond, it’s released very quickly. Further analysis (not presented here) shows that the outlier is a result of thread-pool initialization during startup, when a few objects are allocated pinned, requiring allocating some memory from the operating system. How many objects of which classes are allocated? SGen has probes for five different kinds of object allocation, hence the repetition. User-space pointers to the namespace and class name are passed in the third and fourth argument, respectively, so we concatenate those with a dot in the middle to give the full class name. Whenever possible SGen uses the managed allocator – a small managed piece of code to quickly allocate objects in the nursery, which handles the most common case. The managed allocator is not instrumented with a DTrace probe, however, so for this script to function properly the managed allocator must be turned off via the MONO_GC_DEBUG environment variable. IronPython boxes lots of integers. How many objects of which types are pinned during nursery collections? This is very similar to the preceding script, but we use the pinned object probe and a guard to select for the nursery, as opposed to the whole heap. Here we see the pin counts for the 5 most pinned classes during nursery collections. Combining all nursery collections, for example, 1440 string arrays were pinned. What if we’d like to know how many bytes of memory are pinned in the nursery during each collection? All we have to do is add up the sizes of all pinned objects for nursery collections. Each of them gives us the distribution of the array lengths for array objects of specific sizes. If everything is correct then for each array object size there must only be one array length, which is exactly what we get. For example, all 481 array objects of size 20 bytes have a length of one. In fact, the numbers show that the sizes we get are exactly what we should expect given Mono’s object layout on 32-bits: A reference array with a given length has a size of 16 + 4*n bytes. 1 Don’t try this at home!